2018 MINNEAPOLIS SUPERCROSS: WHAT HAPPENED TO COOPER WEBB? 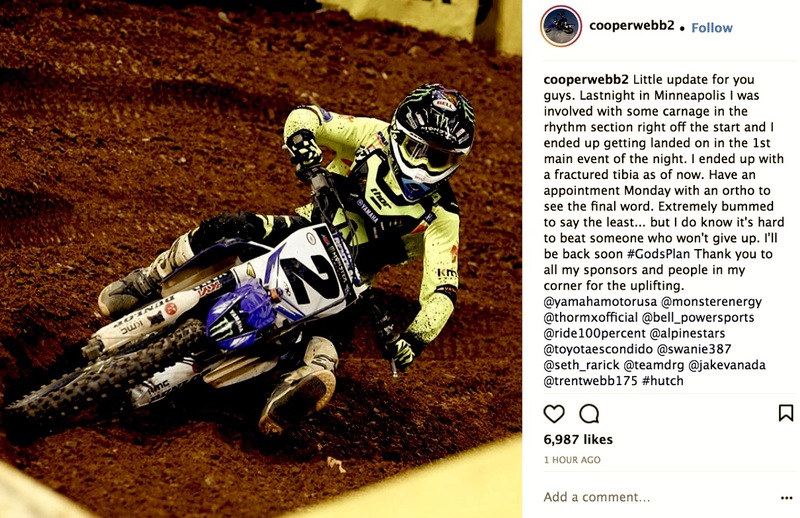 Cooper Webb’s strange Supercross season has come to an abrupt end in Minneapolis, when he was caught up i a crash off the start and broke his tibia. The factory Yamaha rider will miss the final three Supercross events and have some issues getting ready of the 2019 AMA National Motocross season, which starts in six weeks at Hangtown. Webb’s 2018 season was nothing to write home about as he only scored one podium (3rd at Daytona) and three top 5’s (Tampa, Daytona and Seattle). The rest of the time he was way off the pace—and often in altercations with other riders (most notably Eli Tomac).